The Atlas Running Dublin to Belfast Ultra is a 107 mile race from Arthurs Bar in Dublin to the Europa Hotel in Belfast. As if that doesn’t sound hard enough this year the race was on the 29th March, resulting in organisers, competitors and support teams having to make contingency plans for the possibility that Brexit would in fact go ahead. Thankfully the Westminster debacle had no impact on the racing and at midday on the 29th March the runners left Arthurs Bar in Dublin with the intention of covering the 107 miles to the Europa hotel in less than 36 hours. The cut-off points and times for the runners were Dunleer by 12 hours, Newry by 24 hours and finally the Europa. After his win six weeks ago, at the Castleward Last One Standing where he ran 172.2 miles Springwell RC’s Peter Cromie started as one of the favourites in a very competitive field. Setting a steady pace from the start it was Peter and Ed Melbourne, another experienced Ultra Runner who led the field northwards. Both Peter and Ed are well accustomed to ultra running with many individual titles and podium places between them as well as both being finishers in the iconic Marathon des Sables. The 12 hour cut-off at Dunleer and the 24 hour cut-off at Newry were of no consequence to them as after 13 hours of running they were going through Banbridge with just 25 miles to the finish in Belfast. By 4.00am on the 30th March, after 16 hours of running they were still matching each other stride for stride as they passed through Lisburn with 100 miles completed and just another 7 to go. It was over the last 7 miles that Peter’s experience and fitness saw him establish an unassailable lead. After 17 hours and 44 minutes Peter was the first to arrive at the front door of the Europa Hotel in Victoria Street in Belfast. Just 13 minutes behind him Ed finished in a well deserved second place with a time of 17 hours 57 minutes. Congratulations to Peter and Ed on another fantastic display of endurance running. 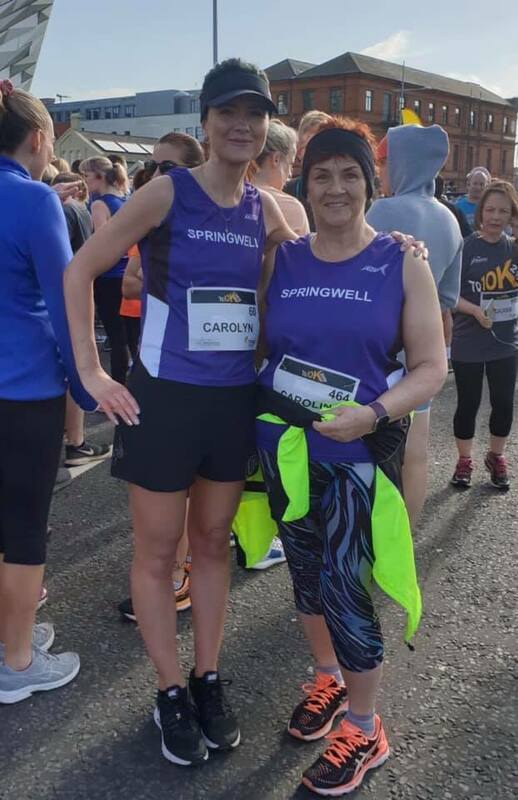 Sunday 31st March saw Springwell RC represented at 10k events in Belfast and Newport Wales. In Belfast Athletics NI hosted the TQ10K in the Titanic Quarter where four Springwell members took to the streets with Noel McAllister the first club member home in 290th in a time of 46.53. In 334th with a personal best of 47.44 was Carolyn Crawford, Martin Hinch ran a 58.16 for 742nd and Caroline Owen a 1.14.37 for 1017th. The Newport 10k had over 3000 runners taking part and Andrew Kincaid was Springwell RC’s sole representative finishing 2782nd in a time of 58.05.